Last month we went to Japan. But this was no ordinary vacation. This was a business trip! The purpose: eating ramen. 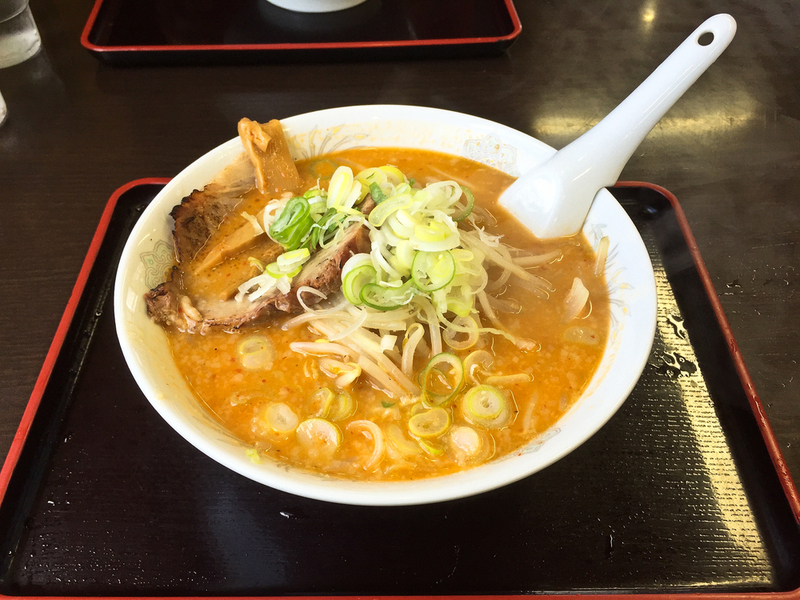 We thought that a great way to evaluate our own product would be to go to Tokyo and eat ramen day after day, trying styles and flavors and absorbing the atmosphere. Daily ramen intake would help sharpen our ramen sensitivities, in a way that would be hard to achieve in the U.S. It's impossible to match the sheer concentration of ramen shops in Japan, or the diversity in the ramen they serve. This kind of experience would give us a better lens to look at what we're doing with Shiba Ramen. Ramen Street Map. Underground mall, Tokyo Station. So we made up our minds to eat ramen at least once each day, and to try two kinds of ramen at every restaurant. Of course, we had to reserve meals for friends and family and for eating toro (which occurred not less than three times). We ended up trying 13 different bowls of ramen over 6 days. We even exceeded our once-a-day goal, once having ramen for both lunch and dinner. Two different ramens at each restaurant, except for one that only had a single-item menu, where we got two bowls of the same thing. 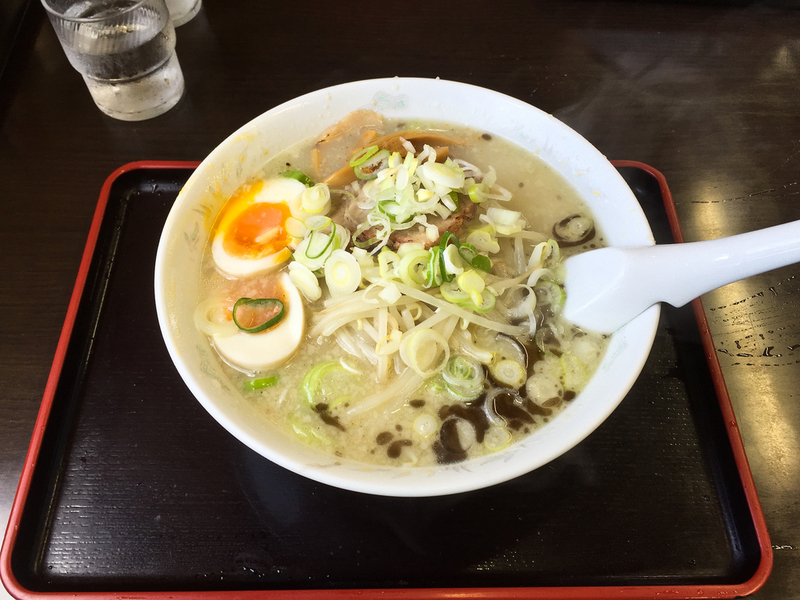 In the process, we tried spicy ramens, clam ramens, soupless ramens, and chain restaurant ramens. At every single place, we paid in advance at a ticket machine (see below). Some places we found through recommendations or website best-of lists, some just because they happened to be there when we needed to eat ramen. Some were great, some were good, and some were just so-so. We measured the ramen's salt content at each restaurant (an important metric). Let's start our ramen tour with three shops outside Tokyo, in Chiba prefecture to the east and Shizuoka prefecture to the West. Next time we'll hit four shops in Tokyo. 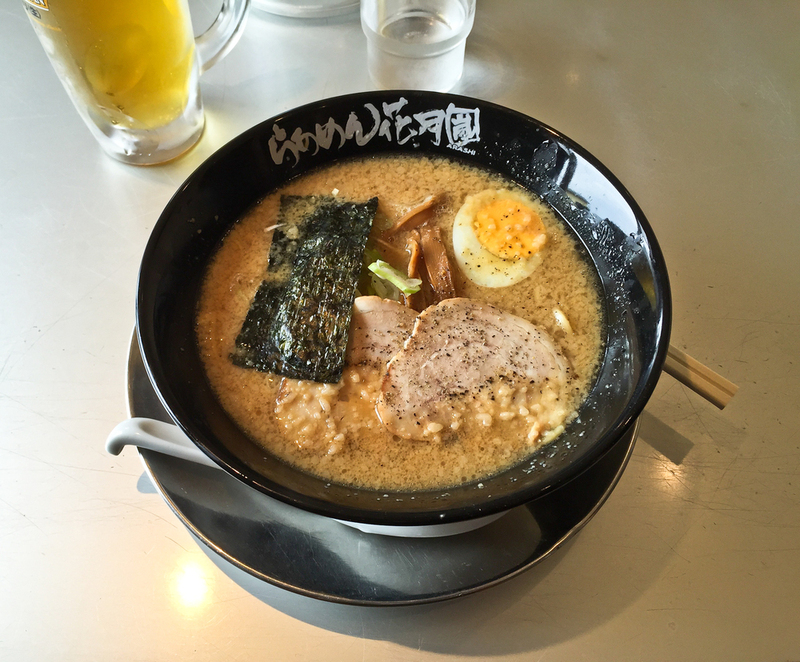 We hoofed it out to Chiba for our trip to ramen school the morning after we arrived in Japan. After our visit, we were starving. We asked Akimoto-san for a recommendation, and he suggested a place called Junki right down the road from Shoku no Dojo; we'd walked past it on the way from the bus stop. This was exciting. First ramen of the tour! 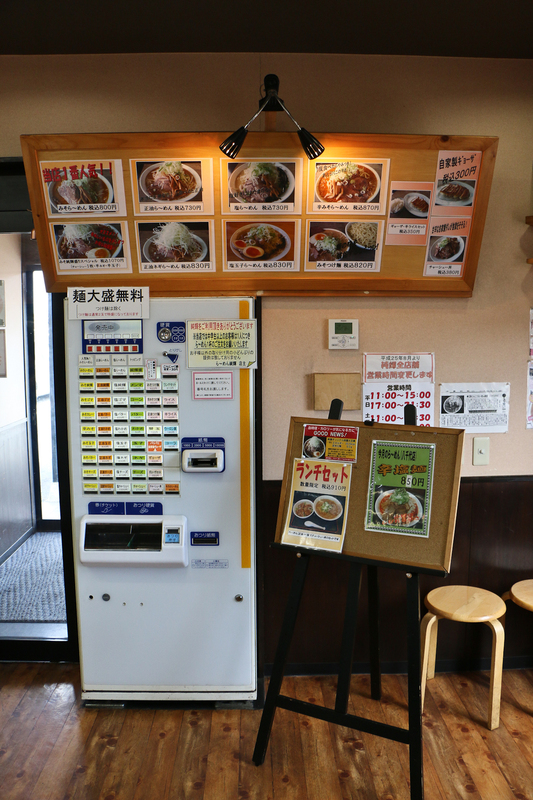 We walked in, and saw right away how ramen is ordered and paid for in Japan: through a ticket machine next to the entrance. We ordered, handed our tickets to one of the servers, and sat down. A few minutes later two bowls of ramen arrived, along with two mandatory beers. We tried a tonkotsu (below left) and spicy miso (below right). Very tasty, a lot of flavor, and a nice pile of vegetables on top. The best part, though, was that they had roasted the chashu over coals, giving it a great charcoal grill flavor. The grilled flavor was pulled into the broth, and enhanced the whole experience. The ramen was pretty salty (1.8% or so) and garlicky. All in all, positive, and I think this ramen would be a hit here in the U.S.
We wanted to try at least one chain restaurant ramen. There are a lot of large ramen chains in Japan, and we wanted to visit one of the more highly rated ones and evaluate the quality of the ramen against the other stuff we were eating. We were passing through the Izu Peninsula, on a Shinkansen bullet train ride from Tokyo to Hamamatsu (Hiroko's hometown), and we got off the train along the way to meet a friend in the town of Mishima. Mishima is near the ocean; they have good sushi there, so our first stop was a sushi restaurant to have some of the local catch (fyi this is 4 hours after an 8:30 a.m. sushi breakfast). But this was also our last chance on the trip to try chain ramen, since our trip home was the next day. So we did a second lunch at what was reputed to be a pretty good chain, Ramen Kagetsu (third-largest chain in Japan with 276 locations). The interior was sort of dilapidated, but it was still pretty full on a Sunday at 1 p.m. We ordered some tonkotsu (lower left) and miso (lower right). When they were hot, they tasted ok. Fairly salty (~1.5%), but not as strong as other places. As they cooled down, though, the taste changed and it became clear that a lot of msg had been added to prop up the flavor. In the end, pretty much meh. We didn't come close to finishing (although we were handicapped by those plates of nigiri we'd downed 30 minutes earlier). On our last day, we took the Shinkansen back to Tokyo and decided to squeeze in one last ramen at Hamamatsu Station. Our real objective was to eat the style of gyoza popular in the area: "Hamamatsu gyoza." Hiroko has been telling me for years about some restaurant that specializes in Hamamatsu gyoza, on the far edge of town out in the middle of a bunch of farm fields. Supposedly this place's cabbage-filled gyoza are hugely popular, so despite the remoteness, we'd planned to go. When we realized there wasn't enough time to get there, we decided to find a ramen shop in the train station. There was only one place, so that's where we went. We got some dark miso ramen (lower left) and clear shio (salt) ramen (right), along with a side of apparently very unremarkable Hamamatsu gyoza. It was solid, but not as good as the stuff we'd eaten in Tokyo, and too salty (2%). The charcoal grilled chashu, however, was redeeming. And now we come to umami science at its most fundamental: the chemical process that plays out in our taste cells when we eat savory foods and experience umami. Umami, we've learned, is caused by the glutamate present in abundance in ramen's ingredients, and amplified by nucleotides through the phenomenon known as "umami synergy." But how exactly do these molecules make us perceive umami? In the final installment of Ramen Chemistry's series on umami science, we're going to answer that question by visiting the surface of a taste cell, where a venus flytrap (of a molecular sort) lurks on the surface. This venus flytrap has an appetite for just one thing--glutamate, preferably with a side of nucleotide--and when it bites down on a meal, it sets off a cascade of cellular signals that causes the brain to say "delicious!" Venus Flytraps. Well, not this kind of venus flytrap. Conservatory of Flowers, GG Park. Photo: Ramen Chemistry. We learned in Part II how the "basic tastes" all derive from the interactions of particular dietary molecules--i.e., glutamate (umami), sugars (sweetness), acids (sourness), sodium chloride (saltiness)--with chemical receptors on the surface of taste cells. There is a special receptor for each basic taste--one for sweetness, one for umami, and so on. It's important to understand that when I use the term "receptor" here, what I mean is a protein; a protein that sits on a taste cell and makes physical contact with a taste molecule like glutamate or sugar. Taste Signaling. Those things marked "T1R2, T1R3" are the venus flytrap receptor proteins that recognize sweet chemicals, setting off a chain of chemical events inside the taste cell, ultimately causing the brain to perceive sweetness. Umami works the same way. Image www.qiagen.com (full link here). This interaction between the taste molecule and its protein receptor is the first step in the perception of taste. It starts what scientists call a signal transduction pathway. Signal transduction is how we perceive and respond to external stimuli, and how our cells communicate with each other to get anything done in our bodies. Now, don't let your eyes glaze over at the sight of a term like signal transduction! It's easy to understand. It works like this: a stimulus--a taste or smell molecule, light, a hormone, a neurotransmitter, etc.--starts the process by interacting with a receptor protein on a cell surface. The receptor protein responds to the stimulus by changing its shape and, in effect, turning "on." That shape change ripples through the cell surface, causing something to happen inside the cell. What follows is a cascade of events in which a succession of proteins is turned on, each causing the next event in the molecular sequence. The end result is a precise physiological response--the taste of umami, the scent of jasmine, or the perception of the color blue. We just learned that the first step in any taste process occurs when a taste molecule causes a taste receptor protein to change its shape. In the umami receptor, that shape change happens in a part of the protein called a "venus flytrap domain" (VFT). The VFT is made of two lobes connected by a sort of atomic hinge. Those lobes can be open or they can snap shut, which is why its called a venus flytrap. Under normal circumstances, the VFT prefers to be open. It's more stable that way. Tangential Relationship. Ramen from Ramen Kyouka, Hiroko's ramen school teacher's restaurant in Tokyo (left). Venus flytrap (right). Things change when glutamate comes along. That's because right near the VFT's hinge is a tiny pocket that is specially adapted to fit a glutamate molecule. When glutamate enters this pocket, its atoms interact with the atoms in both lobes, causing the two lobes to close around it. Glutamate acts as a molecular glue, increasing the stability of the closed VFT. This is hugely important, because the closed form of the VFT is the active form: an umami taste signal is sent to the brain only when the VFT is closed. Umami Signal Cascade. When the VFT closes around glutamate, it causes a shape distortion in another part of the umami receptor, triggering a series of molecular events resulting in umami taste. It turns out that this opening and closing of the VFT also explains umami synergy. Inside the VFT there are actually two pockets. One for glutamate and another, further from the hinge, for the nucleotides IMP and GMP. Umami synergy occurs when glutamate is in its pocket, and IMP or GMP is simultaneously in the adjacent nucleotide pocket. The nucleotide, in essence, increases the strength of the glue, making the closed VFT even more stable. The more stable the closed VFT becomes, the more umami signal is sent to the brain. And with that, we've finished umami science. I have tried to write this series for scientists and non-scientists alike, and it's my hope that all readers have learned something new. Up next, Ramen Chemistry will get back to the business of starting a restaurant. Stay tuned. Have you ever thought about why we dip sushi in soy sauce? We know it makes the fish taste a lot more delicious, but why? Today we'll learn that when we combine the glutamate in soy sauce with the nucleotides in fish, we amplify the umami taste sensation well beyond what either ingredient alone produces. This fascinating phenomenon is called umami synergy. Umami synergy involves the relationship between umami-causing glutamate (MSG) and two additional molecules, the nucleotides inosinate (IMP) and guanylate (GMP). IMP and GMP do not cause umami on their own. But when present alongside glutamate, they are capable of amplifying the umami taste fifteen-fold. Not only is the umami taste magnified, it is more sustained and longer lasting, too. This phenomenon, only recently unraveled at the molecular level, plays a role in worldwide cuisine, driving us to combine ingredients rich in glutamate with those rich in IMP and GMP. Umami synergy is a sort of culinary gestalt: the whole is far greater than the sum of the parts. Glutamate produces umami. Nucleotides (GMP and IMP) by themselves produce no umami. Together, they produce an umami sensation that dwarfs the sensation caused by just glutamate. This phenomenon has a significant influence on the foods we eat. One source explains that "major world cuisines have traditionally relied on umami synergy for deliciousness by combining protein foods with IMP and vegetables with glutamate." We've learned how umami synergy drives the flavor of Japanese dashi broths, by combining the glutamate of kombu with the IMP of bonito flakes or the GMP of dried shiitakes. But Western cuisine is full of examples, too. Tomato sauce (glutamate) combined with meat (inosinate) in pasta Bolognese; cheeses (glutamate) and beef (inosinate) in French onion soup or cheeseburgers; and cheese plus anchovies (inosinate) in Caesar salad. The point is that humans implicitly understood umami synergy, using it to their culinary advantage, well before "umami" was discovered in the early 1900s. Now let's talk about the umami compounds and why they're in our foods. Then we'll learn how the ways we prepare our food increase the concentration these molecules, maximizing our umami taste experience. Umami Synergy. This is a new way to think about beef stew. Umami Information Center. The fact that our foods are often rich in glutamate, inosinate, and guanylate isn't surprising. Present in every living thing, these molecules are absolutely central to biology on our planet. As we learned in Part II, Professor Kikunae Ikeda discovered umami in 1908 when he extracted purified glutamate from kombu. Just a few years later, one of Ikeda's students, Shintaro Kodama, succeeded in identifying IMP as an umami compound when conducting studies on katsuobushi (dried bonito flakes). It wasn't until 1960 that another Japanese scientist, Akira Kuninaka, uncovered GMP's umami-enhancing properties when he isolated it from shiitake mushroom broth. Kuninaka also discovered the umami synergy phenomenon. Glutamate, as we've learned, is an amino acid. Amino acids are the building blocks of proteins. Proteins, in turn, are large amino acid polymers, characterized by complex three-dimensional structures and sophisticated biological functions. Amino Acids and Proteins. Structures of the 20 naturally occurring amino acids, called as such because they possess an "amine" (NH2) group and a carboxylic acid (COOH) group. Glutamate at lower right (left). Proteins are chains of amino acids that fold themselves into highly complex three-dimensional structures (right). All of the amazing complexity and diversity of proteins derives from just 20 amino acid building blocks in mammals. Of those 20, the human body can synthesize only 10. We have to get the other 10--the "essential" amino acids--from our food. And unlike fats and starches, our bodies don't store excess amino acids; we need to consume them on a daily basis to keep all our internal trains moving on time. Amino acids have a range of important biological functions beyond just populating proteins. For example, our entire umami discussion here is premised on free glutamate's role in triggering a complex cellular signaling pathway en route to the taste of umami. Recipe for "chicken stock with umami synergy" at http://umami2u.blogspot.com/2012/12/chicken-stock-with-umami-synergy.html. IMP and GMP, in contrast, are nucleotides. Nucleotides are the building blocks of the nucleotide polymers, DNA and RNA. Three things make a nucleotide a nucleotide is (1) a 5-carbon sugar, connected to (2) a phosphate group, and (3) a nitrogen-containing ringed structure called either a purine or a pyrimidine. Inosinate is the common precursor to two of the five nucleotides used in DNA and RNA, adenylate and guanylate (the other umami nucleotide). Free nucleotides--like ATP, the fundamental currency of energy in living things--are just as important in biology as their polymeric counterparts. IMP is high in meats and fish because muscle cells in animals need a lot of ATP to function. One source explains that "[o]lder animals with very well exercised muscles tend to have more umami, as do fish that are heavy swimmers, such as mackerel, salmon, and tuna." In fact, it's well-known that older stewing hens make better chicken stock than young birds do (see here, here, and here). Just as important for our food discussion is the fact that these biomolecules--proteins, DNA, RNA, ATP--are broken down after an organism dies, increasing the amounts of glutamate and the umami nucleotides in the food source that the organism becomes. The key thing to note is that food preparation has a significant role in maximizing umami. As one author explains, "[p]rocesses such as cooking, boiling, steaming, simmering, roasting, braising, broiling, smoking, drying, maturing, marinating, salting, ageing and fermenting all contribute to the degrading of the cells and macromolecules of which the foodstuff is made." Enzyme-mediated breakdown through processes like fermentation is particularly effective in bringing out umami. One great example is katsuobushi (dried bonito flakes): drying the bonito fish can increase the inosinate concentration 30-fold as cellular ATP is broken down! The same principle applies at sushi restaurants, where the tastiest tuna has likely been aged for a few days before service to a customer, maximizing its umami. ATP Breakdown = Umami. Well, for a while. ATP content is high in animal muscle, because it is needed to power contraction. ATP stops being produced after an animal is slaughtered, and immediately begins to degrade. Inosinate (IMP) is produced within 24 hours, but degrades further in subsequent days. Increasing amounts of inosine and hypoxanthine indicate decreasing freshness. http://www.novocib.com/Freshness_Assay_Kits.html. Next time, we're going into some serious science here at Ramen Chemistry. We're finally ready to understand how umami happens at the molecular level. Stay tuned. Interlude: On Tipping; or, WTF America? I'm starting a restaurant. So I have a lot of decisions to make about how I run my business. Here's one decision I've already made: we won't have table service, and we won't have tipping. Customers will pay at the register in advance, and the price on the menu is what they'll pay. I want our restaurant to be convenient, and our prices transparent. Paying my employees is my problem; it shouldn't be yours. Ever stop to think about why we tip in the first place? Why certain types of employees receive a significant portion of their wages directly from the customer, the amount left to the customer's exclusive discretion? Employees in most jobs, after all, receive all wages from their employers at a pre-agreed amount. You don't tip your auto mechanic or your insurance broker--my legal clients certainly don't tip me--but you do tip restaurant servers, hairdressers, and cab drivers. Tipping conventions are all over the place, and oftentimes we find ourselves guessing what the "rule" is. This absurd phenomenon, where the price listed on the bill isn't really the price, has run amok in America. The Restaurant Payment Transaction. An Ordeal of Inefficiency, Math, and Emotions. The absolute most frustrating part of dining in America is the combined phenomenon of table service and tipping. Not table service in the abstract, mind you. At many restaurants, servers are pretty essential--though not, in my opinion, at a ramen shop. But what gets me is the inefficiency of table service, particularly at the end of the meal. Haven’t you ever thought about it? There you are, you’ve finished eating and are ready to leave, credit card at the ready. But your server is nowhere to be found, so you can’t go anywhere. Can we please have the check? As a matter of fact, dear reader, you’re not even close to going anywhere. First you need to get your server’s attention--something that appears to me inexplicably harder at the end of a meal than at the beginning--and ask for the check. Second, your server needs to go get the check and bring it to you. Third, the server must return to your table to collect the check (pray there are no inaccuracies that would necessitate the recalculation of the check). Fourth, the server must return yet again to deliver your receipt and credit card. In this everyday scenario, your server will have visited your table four times, simply to execute the payment transaction!! But wait! Your ordeal is not over, for now you must do math! And not only must you do math, but otherwise mechanical and objective calculations will be inextricably suffused with emotions. Emotions like guilt! Why? Because the restaurant has transferred to you, the customer, the job of determining how much money its employees should make, instead of just building the cost of service into the cost of the food and being done with it. You feel social pressure to pay more, even when the service was poor, even when you thought your server was a total jerk. Meanwhile, social tipping conventions continue to become more onerous. When I was a kid, 15% was acceptable. My guess is that, today, most people do 20%, and restaurants will even suggest 25% tips on your receipt. Note re outrage: it gets my blood boiling when this suggested tip is based on a percentage of the combined food and sales tax—nobody should pay for service as a percentage of a wholly separate government surcharge. Tipping. Remind me why we do it this way? So there you are. You’ve split the bill four ways with your friends, and you’re all waffling about what to do. You’ve had a couple of drinks and you’re full; it’s late. Math isn’t coming easily. You’re simultaneously trying to be accurate and fair, while desperately hoping you don’t seem like a cheapskate--an even greater risk when four people separately calculate tips on the same base amount. Again, why is this your responsibility? This Slate article from 2013 makes the same point, explaining that federal tax law encourages restaurant industry employers to rely on tip-based compensation, turning the "customer into a co-employer." Another great piece on American tipping culture from Kitchenette is here, if you're interested. Let Us Gaze Upon the Rising Sun and Rejoice! In other countries, it isn’t your responsibility. American-style tipping isn't the norm in Europe, although in some countries a small gratuity can show appreciation for good service. As an American, I’ve always been terrified of paying in Europe--should I leave a tip, how much should I leave, if it’s too little will they be offended, if it’s too much will they be offended, if I leave anything at all will they be offended? In Japan, there’s no tipping. Ever. At any time. Japanese service is world-class, so it can’t be that tips somehow incentivize better service. It’s just that a phenomenon that is supposed to incentivize better service has been coopted by the restaurant industry and distorted into a default measure of compensating its workers, using smoke and mirrors to make prices seem lower than they really are. Awaiting the Idaho Burger. Left: A Japanese restaurant where tips are not required. Right: A Japanese restaurant where tips are not required. And you know what else is great about Japan? They’ve got table service figured out. You’ll recall my concerns with end-of-dining efficiency in the U.S. No problem for the Japanese. Oftentimes, when a server brings food to your table, an updated check (or an order tally) comes with the food. So when you decide to order another beer, an updated bill will come with your new round. And you’ll just take it to a register to pay on your way out. So instead of four separate trips to your table by your server, it’s just one trip by you to the register. And off you go! The way food is served and paid for in this country is a real concern to me, and I think there’s a lot of room for improvement. I suspect I’m not the only one who feels this way. Next time at Ramen Chemistry, we’ll be back to umami science. OK, so now we know that umami has a huge role in worldwide cuisine. It's got a Japanese name, but it's hardly an exclusive Japanese thing. Nevertheless, given the prevalence of umami in Japanese food, it's not terribly surprising that a Japanese scientist first "discovered" umami as a distinct taste phenomenon with a distinct molecular basis. And this was only about 100 years ago, meaning that the "umami" concept is a pretty recent one, even in Japan. Umami was discovered by Kikunae Ikeda, a chemist at Tokyo Imperial University (today's University of Tokyo, Japan's most elite school). After a contemporary hypothesized that "good taste stimulates digestion" Ikeda was apparently inspired to research the connection between flavor and nutrition. Having grown up eating large amounts of kombu dashi (high-umami broth made from a kind of kelp called kombu in Japan), Ikeda had noticed something unique about dashi. It was mild, yet highly distinctive. It wasn't sweet, salty, sour, or bitter. So Ikeda set out to identify the chemical basis of kombu's flavor. Original MSG. The first Ajinomoto product (left) and Professor Ikeda's lab notebook (right). Photo Ajinomoto. In order to understand the significance of Ikeda's discovery, we need to understand the concept of "basic tastes." According to Ikeda, "physiologists and psychologists recognize only the four tastes sour, sweet, salty and bitter." He distinguished other apparent "tastes" as being something else: "A hot sensation is just a skin mechanical sensation" and "such qualities as metallic, alkaline and astringent are not considered to be tastes (at least not pure tastes), because they cannot be separated from the sensation accompanied by tissue damage." Now let's pause for a second and consider that last statement. How does one draw a line around what constitutes a "taste" and what doesn't? Ikeda was writing before we knew a whole lot about cell biology, so we'd like to know how these phenomena are classified by modern scientists. It seems that the five "basic tastes" all are due to interactions of particular chemical compounds with associated chemical receptors in the taste buds. Tongue. Up close with a scanning electron microscope. As a recent article entitled "The Cell Biology of Taste" explains, taste "is the sensory modality generated when chemicals activate oral taste buds and transmit signals to a different region of the brainstem." But the article goes on to state that "[t]aste is commonly confused with flavor, the combined sensory experience of olfaction [smell] and gustation [taste]." It "is also commonly confused with somatosensory sensations such as the cool of menthol or the heat of chili peppers." This latter phenomenon, through which other non-taste nerves in the mouth "are capable of responding to irritative chemical stimulation" is referred to as "chemesthesis." Generally speaking, chemesthetic sensations include (1) chemical irritation and pungency (examples include capsaicin in chili peppers, piperine in black pepper, gingerol in ginger); (2) astringency (examples are tannins and ethanol in wine); and (3) cooling (menthol in mints). All that said, research on taste is still evolving. For example, "The Cell Biology of Taste" explains that "evidence is mounting that fat may also be detected by taste buds via dedicated receptors," meaning that "fat" may turn out to be a sixth basic taste (fatty flavor has historically been viewed, like chemesthesis, as "somatosensory" in that it derives from a food's texture rather than arising through a gustatory signaling pathway). The linked articles above, as well as this BBC piece, are really illuminating if you're interested in further reading on taste science and chemesthesis. Signaling Pathways. The basic tastes and their associated cellular protein receptors (left). The mechanisms by which the five basic tastes operate in taste cells (right). Excellent and detailed explanations of both figures here: http://jcb.rupress.org/content/190/3/285.full. So why do we experience these basic tastes in the first place? Why did we develop these complex signaling pathways so that we could experience the tastes of sugars, organic acids (sourness), glutamate, and salt? Professor Ikeda was inspired by the notion that "good taste stimulates digestion." And that notion--that taste sensations send a message to the stomach to prepare for digestion of the kinds of foods being eaten--is tied to the evolutionary history of taste. Taste evolved not only as a means of stimulating digestion. It also evolved as a way to lead us toward nutritious foods--and away from poisonous ones. One scientist explains it this way: "Among the five tastes, salty, sweet and umami (meaty or savory) are appetitive, driving us toward essential nutrients, whereas bitter and sour are aversive, alerting us to potentially harmful substances." And another pair of authors tells us that each of the various basic tastes "is believed to represent different nutritional or physiological requirements or pose potential dietary hazards." An Acquired Taste. Bitter melon. Sweetness signals the presence of carbohydrates, saltiness signals critical dietary salts, and umami signals protein. Bitterness is described as "innately aversive" and signals the presence of toxic compounds (it's no coincidence that a lot of poisons actually taste bitter). It's probably not a coincidence that our sensitivity to bitter compounds is significantly stronger than our sensitivity to sweet compounds. Sourness is considered "generally aversive," because our bodies want to control the amount of organic acids taken in. That's also why spoiled foods, which contain lots of acids, often have a sour taste. Let's go back to Ikeda's seminal 1909 paper, entitled "New Seasonings," in which he postulated that "there is one other additional taste which is quite distinct from the four tastes. It is the peculiar taste which we feel as 'umai' [loosely translated as "savory" or "delicious"] arising from fish, meat, and so forth. . . . I propose to call this taste 'umami' for convenience." Ikeda employed a painstaking series of extractions, chemical separations, and crystallizations to ultimately identify ionic glutamic acid as the source of umami. And when I say "painstaking," I mean it. Ikeda worked in an age before the technological revolution gave us the wide array of powerful analytical instruments we now have at our disposal. The techniques he used are practically a lost art today. An article in the Journal Chemical Senses distills Ikeda's work as follows: it "was done with the procedures of classical chemistry, aqueous extraction, removal of large-scale contaminants  by crystallization, lead precipitation and numerous other steps of preparative chemistry. Finally, low-pressure evaporation resulted in the slow crystallization of a single substance with the mass formula C5H9NO4: glutamic acid." How Times Have Changed. Ikeda probably worked in a lab like this one at MIT (top). His task would be a lot easier today with techniques like LC-MS (liquid chromatography-mass spectrometry) (bottom). Reading "New Seasonings," one is struck by the number and variety of steps Ikeda had to undertake in order to take a piece of kelp and reduce it down to pure crystals of the single molecule responsible for umami (actually he took 38,000 grams--about 84 pounds--of dried kelp, and reduced it to 30 grams of glutamate). Getting there must have required a tremendous amount of trial, error, and, above all, patience. For this achievement, Ikeda has been named one of Japan's "Ten Great Inventors" by the Japanese Patent Office. But Ikeda took it a step further and commercialized his invention. As he explained in his paper, "[a] rational method of production satisfying this natural preference [for umami] must be developed." And so it was. Ikeda obtained a patent on his process and partnered with "Mr. Saburosuke Suzuki, a well-known iodine vendor," and created Ajinomoto, the company that pioneered the commercialization of MSG. If you see MSG in a grocery store today, there's a good chance it's sold by Ajinomoto. You can read more about Professor Ikeda and his discovery here, here, and here, if you want to know more. Next time, we'll find out about umami synergy: the way certain ribonucleotides act in concert with glutamate to significantly amplify the umami response.